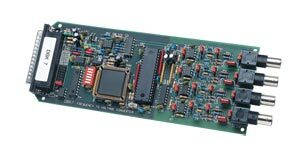 The OMB-DBK7 frequency-input card provides OMB-LOGBOOK and OMB-DAQBOARD-2000 Series data acquisition systems with four channels of frequency-measurement capability. The card measures the input signal’s frequency and converts the frequency to a voltage, which can then be measured by the data acquisition system. The OMB-DBK7’s output is read by the data acquisition system along with any other analog channels included in the analog scan group, allowing easy correlation of readings from the OMB-DBK7 with other test parameters. As many as as sixty-four OMB-DBK7’s can be connected to one OMB-LOGBOOK and OMB-DAQBOARD-2000 series acquisition system, for a total of up to 256 channels. The OMB-DBK7 accepts AC-coupled analog inputs up to 80 V p-p. Each of its channels is equipped with a low-pass input filter that is jumper selectable for 100 kHz, 300 Hz, or 30 Hz. The card can accommodate 1 Hz to 100 kHz measurement of signals from 50 mV to 80 V p-p. The OMB-DBK7’s digital inputs, which can measure signals from 0.001 Hz to 950 kHz, feature TTL Schmitt-trigger levels and can accept DC-coupled signals from -15 V to +15 V. The OMB-DBK7’s digital inputs are equipped with pull-up resistors for use with relays or switches. The OMB-DBK7 provides 12-bit resolution at any frequency from 1 Hz to 950 kHz. For ranges from 1 Hz to the user-defined maximum upper range boundary, the voltage conversion update will occur every 2 to 4 ms or the period of the input frequency, whichever is greater. With a range of 0 to 10 kHz, the OMB-DBK7 will update every 2 to 4 ms. If the range is 0 to 60 Hz, the output will update every cycle or 16.6 ms.